We print team strips for kids, schools and adults. Print and personalise football shirts in a variety of ways including with your name, player number, sponsorship logos and team logos. 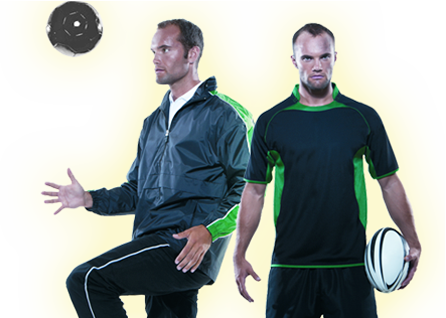 See our catalogue for a wide range of sports clothing, for men, women, children and youth sports teams. Customise rugby and drill shirts for your team. We also print on tracksuits, hoodies, baseball caps and almost anything else you need for your sports team. Player names, numbers or even sponsorship - your team strip can be personalised whatever way you choose. Call us on 01392 364407 to find out more. We use well-respected sports clothing brands like Fruit of the Loom, Canterbury, Slazenger Hanes, Kariban, Henbury, Russell, Tombo, Regatta, Spiro, Gamegear and plenty more. Browse our catalogue. We offer local delivery in and around Exeter. For orders elsewhere in Devon and nationwide, we use a trusted delivery service. Last minute job? Ask about our express service if you need your printed or embroidered clothing fast. We start offering wholesale discounts from just 10 pieces. Order exactly the quantity you need and still get a great deal! See examples of previous orders in our gallery. If you don't see what you're looking for, give us a call on 01392 364407. "They LOVE their hoodies! And they're all exactly right. I especially appreciate the smiley faces and the star. I know you went to a lot of trouble."